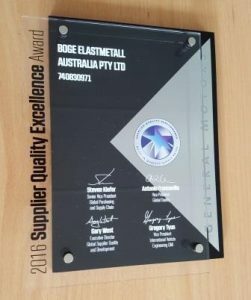 BOGE Australia the makers of Polyelast were today awarded Holden’s Supplier Quality Excellence Award for a 4th consecutive year. This award recognises the attention to detail and the quality that underlines everything we do. We are delighted to be recognised by a global customer the size of General Motors.